The NBA trade deadline has us all sitting on the edge of our seats, or in the case of Brandon Jennings, sitting on the edge of our seats, looking like this guy. One guy who, despite all the specualtion, seems to be taking the speculation like a grown-up is Pau Gasol. And that could have something to do with the sporting culture from which Gasol comes. Spain is a football country. In European football, rather than have trades, you have transfers. Sometimes a player agitates when he thinks more money or trophies can be found at a different club. In other cases, the club looks to sell the player, capitalizing on their initial investment. Rumors about prospective transfers are planted by clubs, player agents, and shadowy figures, and then published in periodicals with the most sympathy to their respective cause. It’s all very sneaky, and very fascinating, and it can make you very cynical, very fast. 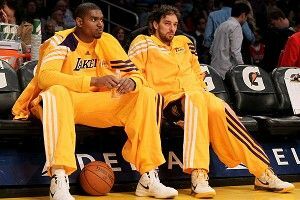 So it should come as no shock to find that Gasol finds none of this trade talk particularly shocking. The (at least for the time being) Laker recently gave an interview with the Spanish sports daily, Marca. The picture you get is not one of a despondent, shattered basketball player, but rather a cultured veteran, well aware of the twists and turns a life in professional sports can take. Elsewhere in the interview he uses Lamar Odom’s trade as an example of why he’s not taking any of this personally: “Seeing that you get an idea of how things work,” he said. But where Odom has been a shadow of his candy-ingesting self this season in Dallas, following his surprising move to the Mavs, Gasol seems like he has a much better grasp on the realities of life in the NBA. “Like so many things in life, this is something you cannot control,” he said. That’s news to Dwight Howard.